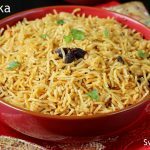 Biryani rice recipe – kuska rice or plain biryani without vegetables made in south Indian muslim style. This is different from the biryani rice or biryani chawal that is served in North Indian restaurants. 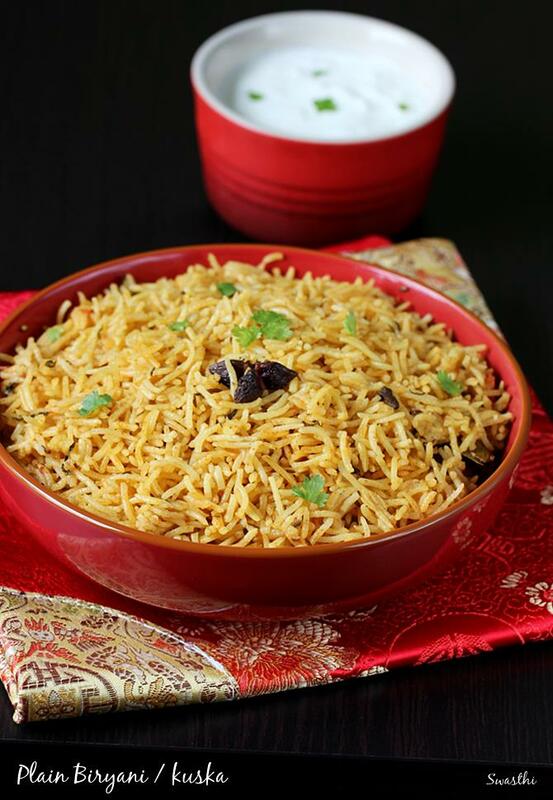 You can also check this recipe of Biryani chawal known as “GHEE RICE” in South India. 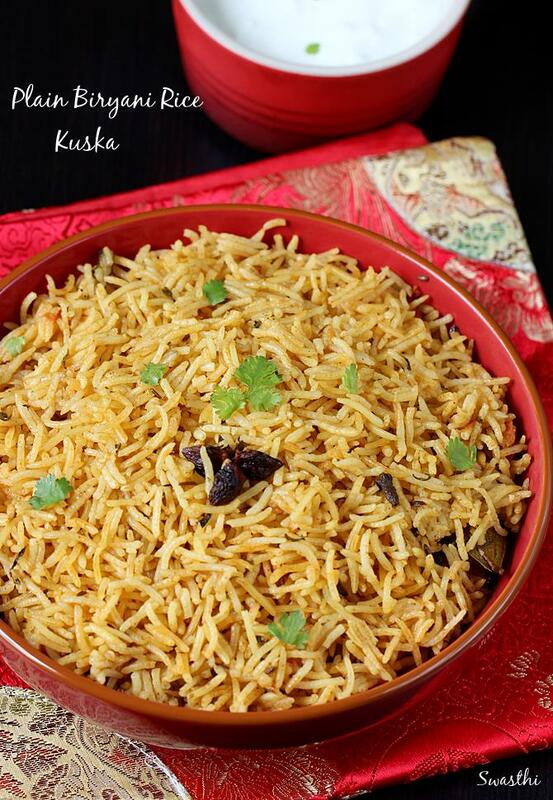 One can also find this biryani rice or kuska in South Indian restaurants with a Non-vegetarian Meal. This biryani rice is made without vegetables so no chopping or grinding work and yet it tastes flavorful. One can find slightly different versions of these, while a few folks use mild flavorful biryani masala powder. 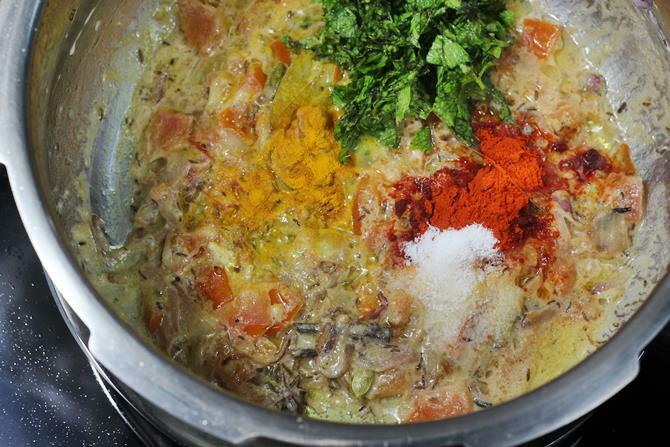 It is all up to ones choice of whether to used ground spices or skip them. Wash and soak rice for at least 20 minutes. Drain water completely. Set aside. Heat a pressure cooker or a heavy bottom pan with oil. 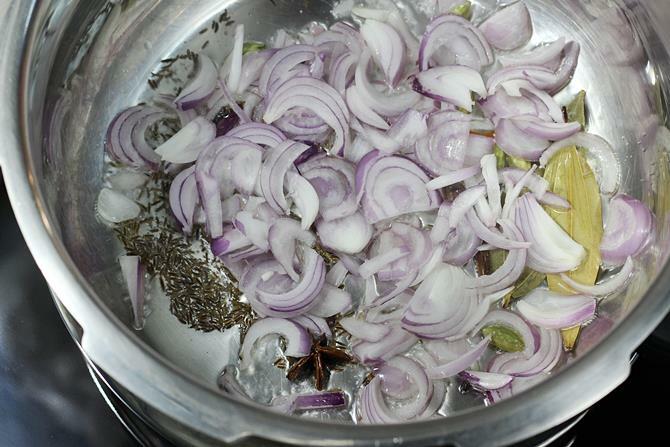 Add spices and fry till they turn fragrant. Next add onions and fry till onions turn golden. 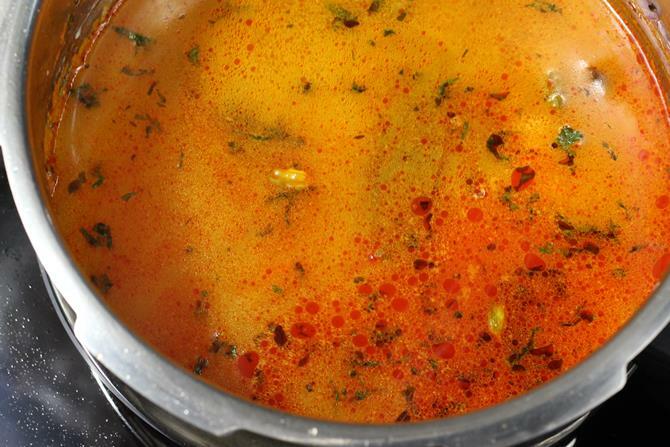 Transfer tomatoes,curd, red chili powder, pudina, coriander, salt and turmeric. If using biryani masala powder add it now. Fry till tomatoes turn mushy, soft and pulpy. The mixture begins to leave the oil as well. 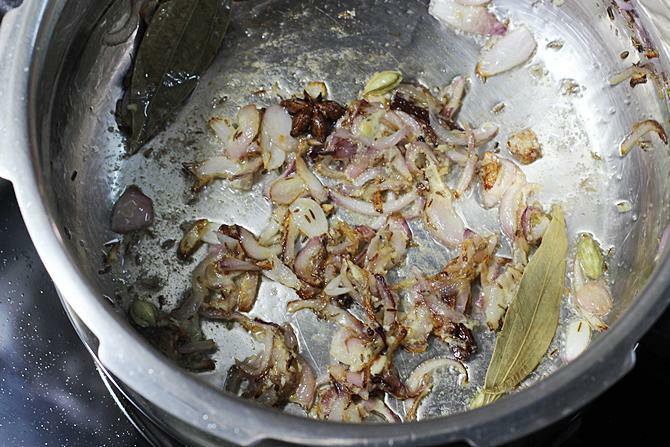 Cover the pressure cooker with the lid, cook on a low flame for 3 to 5 mins. Do not let the cooker whistle. 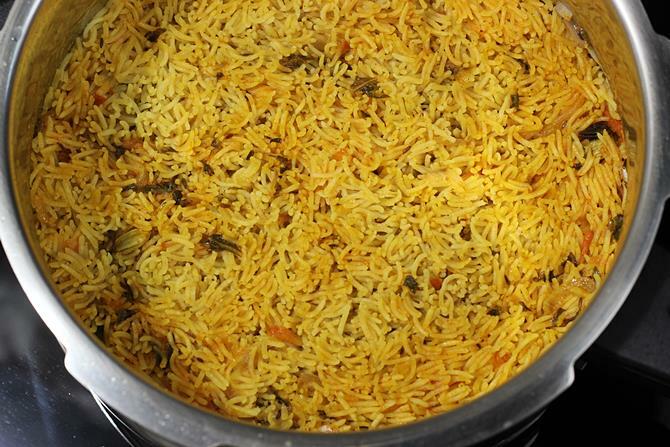 if cooking in a pan or casserole, just cover tightly and cook till the rice is fully done. it could take around 5 mins. If using normal rice, allow to whistle once. Let the pressure go off, then fluff up the biryani kuska rice. 1. Wash and soak rice for about 20 to 30 mins. Meanwhile prepare the onions and tomatoes. After 30 mins drain the rice completely to a colander. Set this aside. 2. Heat oil in a pot or pressure cooker. 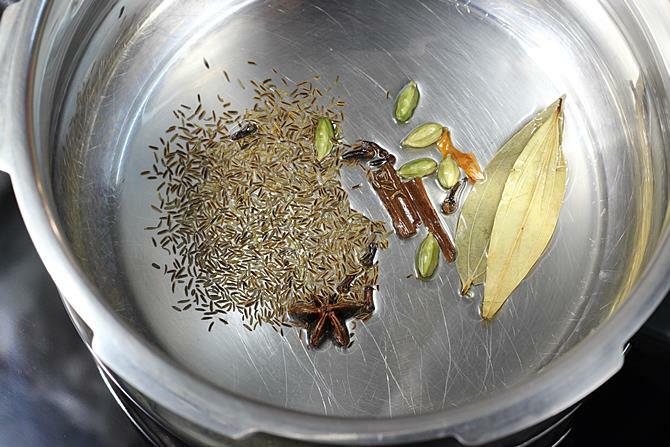 Add bay leaf, star anise, cardamoms, cloves, cinnamon, shahi jeera and mace. Saute until the shahi jeera splutters. 3. 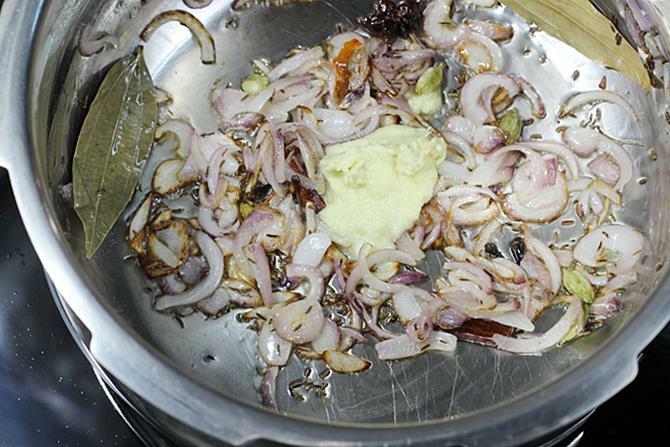 Add sliced 3/4 cup onions and fry until golden. 4. Add 1 tbsp ginger garlic paste and fry until it smells good. 5. Make sure the raw smell of garlic goes away. 6. Add tomatoes and yogurt. Stir to prevent burning. 7. Add 1/2 to 3/4 tsp red chili powder, little turmeric, handful of mint, coriander, salt and 1 tsp biryani masala powder (optional). For the kuska rice, most ppl do not use biryani masala powder. 8. 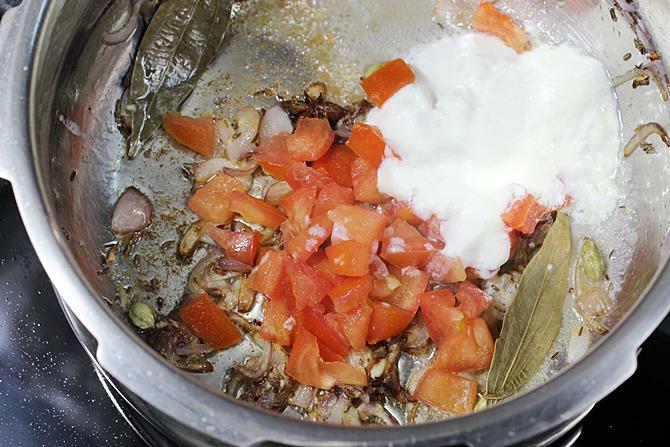 Cook until the tomatoes turn mushy and oil begins to separate. 9. Add 3 1/2 cups water. Bring it to a boil. 10. Add drained rice. Mix well. 11. Cook on a medium flame until very little water is left. Refer the picture. Lower the flame completely. Cover the pot or pressure cooker with a lid and cook for exactly 5 to 6 mins. I used a pressure cooker. 12. When the rice is done, open the lid and fluff up. 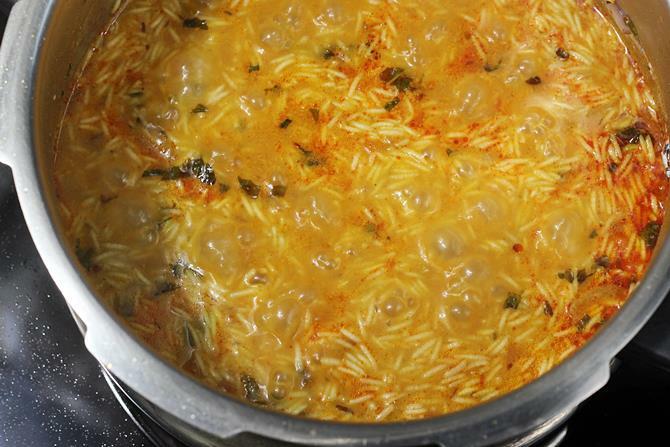 Serve with raita or with any of the biryani gravy. Very neat and tastey recipe. I tried it came out very well. You are welcome. Thank you so much for the comment. Glad to know biryani rice turned out good. I made this yesterday for my son’s lunch box and I was surprised to see it demotivated school. He just loved it!!! He is 3.5yrs old and never eats anything that is packed in his box so decided to try this one and it was a hit!! Thank you so much for the comment. Made me so happy. So glad to know the recipes are useful. Thanks a ton again for the wishes. 1 cup (240 to 250 ml cup) will be enough for 2. If you are making for men then use 1½ cups. 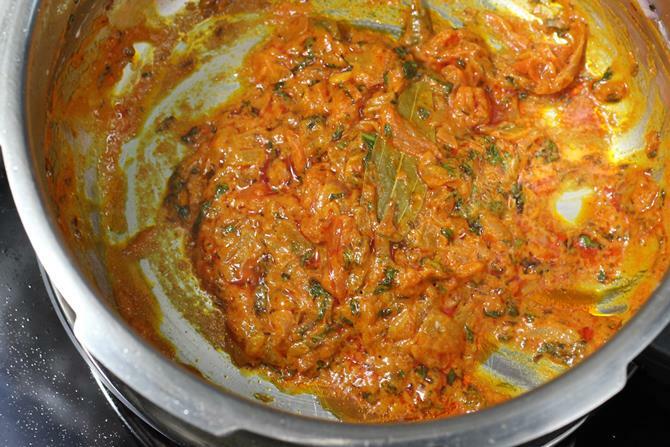 I LOVE THIS RECIPE SOOOO MUCH…IT IS AMAZING DISH FOR SERVING OUR RELATIVES TOO WHEN THEY COME HOME.I HAD TRIED THIS RECIPE TWICE AND ALL MY FAMILY MEMBERS SAID IT WAS SO DELICIOUS ….THANK YOU FOR THE SAME .. So glad to know you all liked it. Thanks for the comment. It made me happy! This recepie is so simple and easy to prepare. It is so tasty, my husband loved it. Thank you very much Swathi?? Thanks a lot for trying. Yes as you said it is possible to fry the onions in the beginning and set aside. But they wont turn crisp unless deep fried with some corn flour sprinkled on them. 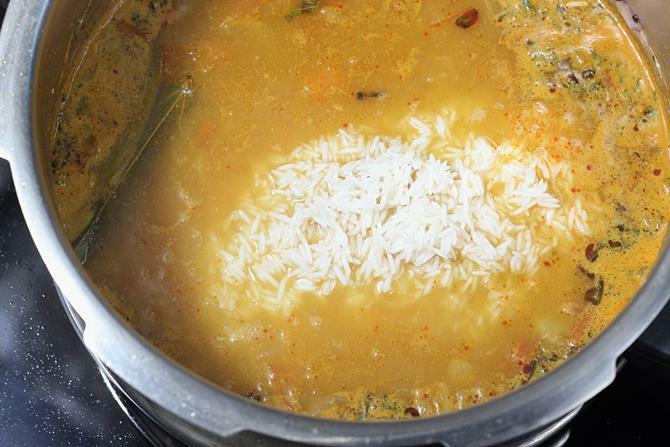 I have shared a similar recipe here – Ghee rice. It depends on individuals taste, as you mentioned this may not go well with those who do not like soft cooked or chunky onions. In that case using onion paste & tomato puree is good. But the speciality of this kuska rice is it uses onions in the sliced form and they add taste to the rice. Thanks a lot for the suggestion. I will try to make a new recipe based on your points and will also update this post. Tried this Recipe…it was so simple to prepare and taste was awesome ??? Can i make this with pre-cooked rice? I dont think this works good with precooked rice. You can try this recipe. You can replace veggies with tomato in the rice. When should I add vegetables if needed? This reception I tried today and it was really awesome !! But I have a doubt if I want to add veggies to this recipe at which step should I add them ?? Thank you. You can add them just before adding water. Saute the veggies and then pour water.